It may not look like a holiday gift, but to the wrestler enthusiast, it’ll make a fine gift. 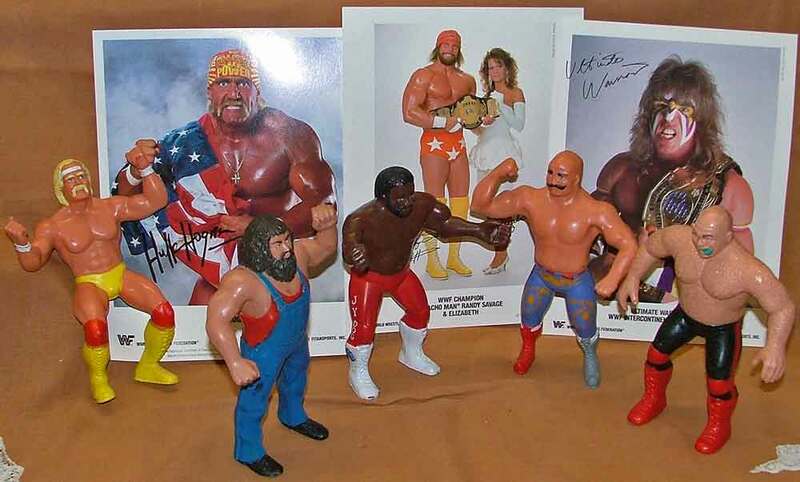 In the photo above, the figures (left to right) are: Hulk Hogan, Hillbilly Jim, Junkyard Dog, Iron Sheik, and George “The Animal” Steele. The photos behind the figures are (l to r): Hulk Hogan, Macho Man Randy Savage and Elizabeth, and Ultimate Warrior. These would make great stocking stuffers for the ‘big or small’ wrestling enthusiast on your list. By the way, are you aware there is a Pro-Wrestlers Hall of Fame. Yep…. Click on that link and check it out. By the way, they’re working on updating their site… so keep checking back on their site. Be sure to check out the continued 44 Days of Gift Giving Ideas that we’ll be sharing throughout the holiday season. Then stop by our shop… ’cause we’ll be watchin’ for ya!